In 2007, a new breed of LEGO set was released: the modular building. 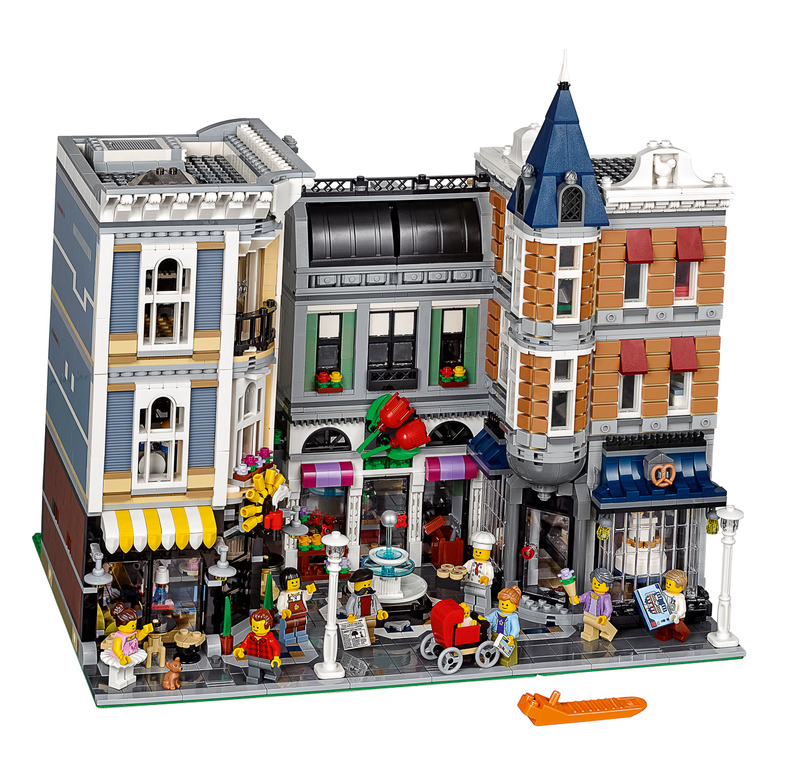 The first offering, the Cafe Corner (10182) was revolutionary: the subject matter of Lego City, perhaps set in an older, simpler time, but with a scale that was appealing to AFOLS. The design standard – specifying the placement of the technic bricks to bind adjacent models together, as well as defining the size of the footpath and alleyway at the back of the building – has inspired the theme as well as countless MOCs and LEGO cityscapes around the world. That Very First Modular- the Cafe Corner had very little in the way of internal detail, but set a standard this has changed as the series has developed with detailed interiors for shops, homes and other miscellaneous businesses one of the highlights of the series. In those early days, the LEGO Factory site referenced design ideas for interior design . 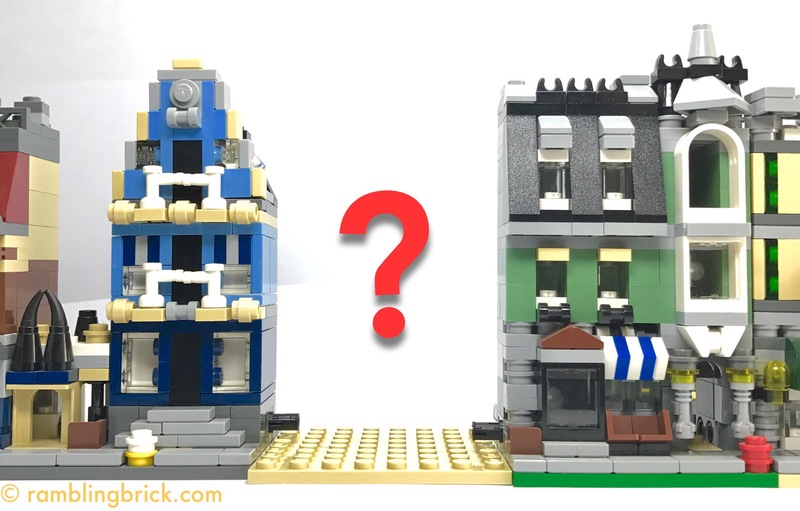 As a now annual New Year’s treat, there has been a steady roll of buildings to add to the collection: Market street (10190), Green Grocer (10185), the Fire Brigade (10197), the Grand Emporium (10211), the Pet Shop (10218), the Town Hall (10224), Palace Cinema (10232), the Parisian restaurant (10243), the Detective’s Office (10264) and the Brick Bank (10251). The majority of these sets have been designed by Jamie Berard, who has taken on the task of assembling an homage to the entire range in this year’s 10th Anniversary Spectacular: Assembly Square (10255). 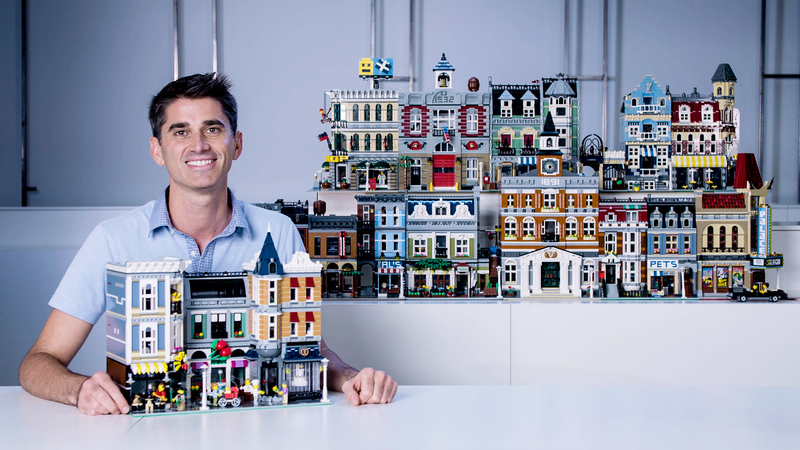 LEGO Designer Jamie Berard, pictured with all of the Modular buildings, including the newly announced 10255: Assembly Square. There are eight adult Minifigures and a baby included in this set. Like all Minifigures in the modular line, these feature the classic ‘smiley’ face. All of the mini figures have great characterisation, and there are lots of new elements to be found. One of my favourite figures would have to be the musician, with his receding ‘Peter Venckman’ hair line. Another exciting variation on the 1×1 brick: 2 studs on adjacent sides. Minifigure scale printed Cafe Corner box; 1×1 quarter circle tiles (black, tan and waffle); 2×2 and 4×4 quarter circle radii tiles in light bley; a mirror (4 x 6); 2 x 2 corner tiles, with the corner cut off in white, dark blue, light and dark bley; a 4×8 , diagonal door frame in black; and an exciting element with huge potential in MOCS, and in generating confusion when placing brick link orders: a 1×1 brick with 2 studs on adjacent sides. Recolours include a 1×1 tile in nougat; a silver 2×2 radar dish; a curved window arch with spokes in black; and a new window for the dentist’s office: “Prevent yellowing.” Sound advice for those of you without ageing, sun damaged LEGO Bricks. As you can see, this babysitter is a serious LEGO Fan: she has got a boxed copy of 10182: Cafe Corner to put together. It must be super micro scale! It is shaping up to be a huge set, measuring 35cm (13″, approximately 40 bricks) tall, 38cm (14″, 48 studs) wide and 25 cm (9″, 32 studs) deep. The additional 16 studs of width is reflected in its piece count, and the price tag. There are 4002 pieces: that’s 1200 more pieces than the largest previous modular (The Town hall xat 2766 pieces). Priced at $US279.99/ UK£169.99 this is a significantly greater investment than previous modulars (for example: Brick bank (10251) is priced at $US169/UK£119), but you also get so much more. It will be available at shop.lego.com on January 1 2017, and is recommended for ages 16 and up. Unfortunately, there will not be an opportunity for LEGO VIP members to order early.